Afghan Special Security Forces launched a complex operation to provide relief to Commander Samad and his Afghan Local Police members in Khas Uruzgan, Uruzgan province last night. This operation included four Mi-17 helicopters from the Afghan Air Force, which launched during hours of darkness from a base in Kandahar province. The local police unit had been guarding villagers and family members for weeks from attacks by the Taliban in this narrow valley at an elevation of 2,800 meters. Landing within 50 meters of the besieged compound, the four helicopters and elite members of an Afghan National Mission Unit recovered close to 60 villagers and family members. In accordance with the orders by the Ministry of Defense and Lieutenant General Raziq, the Afghan Special Security Forces relocated the oppressed villagers from Khas Uruzgan to a safe location. 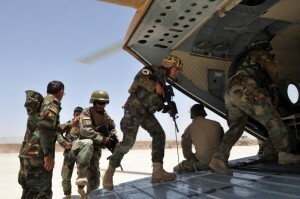 The Afghan Security Forces are committed to continuing operations in order to provide stable security in Uruzgan province.